While most gold-colored watches are electro-plated with a very fine layer of gold, and worth much more as a timepiece than as a source of precious-metal, solid gold watches have risen dramatically in value lately. As a buyer of all precious-metals, Canada Gold is pleased to offer the very highest payouts on all solid gold watches in any condition. Whether its an old Rolex, Cartier, Hublot, Breitling, Omega, Piguet, Breguet, IWC, Perrelet, or even a Patek Philippe, if it’s solid gold and has seen better days, or is a more common model, it’s probably worth more in precious metal content than as a watch. 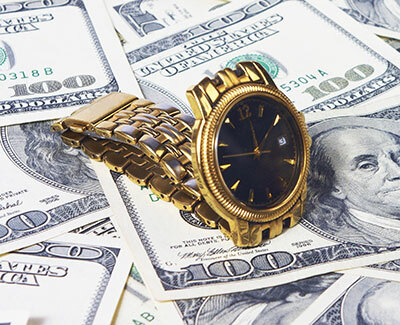 Many other less-known companies have produced solid gold watches over the years which have little to no collectible value, yet contain precious-metals that are very valuable on today’s market. How can you tell if it’s solid gold? Watches are almost always stamped if they are solid gold, you will likely see the common hallmark of 10k, 14k, 18k, 417, 585 or 750 stamped somewhere on the back or the inside of the casing (you may need to remove the casing to see it). If you have such a watch, call us to book an appointment for a free, no-obligation evaluation and purchase offer. We will examine your watch in our secure offices, perform the necessary tests to determine the gold purity and weight of the gold components, and make an offer which you are welcome to accept or decline. We understand that many watches are sentimental and, even at today’s high values, are difficult to part ways with. The highest payouts for gold watches, yet another great way to cash-in at Canada Gold!